Collision in prehistory. – The Chiemgau Impact: research in a Bavarian meteorite crater strewn field. – Zeitschrift für Anomalistik, vol. 17 (2017), p. 235-260. State of research on the Chiemgau Impact 2017 – English translation of the full article – click here. La formación Pelarda: eyecta de la estructura de impacto de Azuara (España): características deposicionales, edad y génesis. Click the article! [Pelarda Formation – ejecta deposit of the Azuara impact structure (Spain): Deposition characteristics, age and genesis]. New article about one of the most important impact ejecta deposits in the world: 75 pages, more than 90 illustrations – most current version. Spanish with English abstract. Abstract. – The Pelarda Formation (Fm. ), located in the Iberian System in northeast Spain is a sedimentary deposit with an extension of roughly 12 km x 2.5 km and an estimated thickness of no more than 400 m. The formation was first recognized as a peculiar unit in the early seventies and underwent interpretations like a fluvial or an alluvial fan deposit having a postulated age between Paleogene and Quaternary. Since the early nineties the Pelarda Formation has been considered an impact ejecta deposit originating from the large c. 40 km-diameter Azuara impact structure and meanwhile being among the largest and most prominent terrestrial impact ejecta occurrences, which however is questioned by regional geologists still defending the fluvial and alluvial fan models. Roughly speaking, the Pelarda Fm. 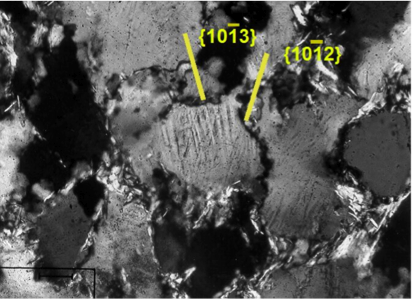 is a grossly unsorted, matrix-supported diamictite with grain sizes between silt fraction and meter-sized clasts. 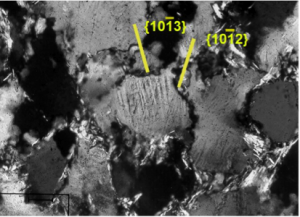 Strong clast deformations and abundant shock metamorphic effects like planar deformation features (PDF) are observed throughout the Pelarda F. deposit compatible with its impact ejecta origin. Aligned bigger clasts and smaller intercalated bands of sandstones, siltstones and clayey material indicate some local stratification obviously adjusted to flow processes within the impact ejecta curtain. 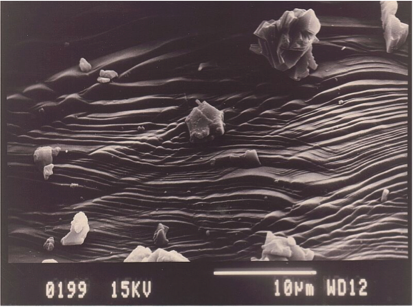 This suggests that gravitational flows predominated in a transport by water in both liquid and gas states. Transport and deposition as a kind of 2 pyroclastic surge are discussed. A sketch sequence describes the emplacement process of the Pelarda Fm. as part of the Azuara crater formation and the integration in the general frame of pre-impact geology and some post-impact layering. Quartzite megaclast from the Pelarda Fm ejecta deposit. PDF in shocked quartz grain; quartzite clast from the ejecta deposit..
Abstract. – Pink quartz, not to be confused with rose quartz, is an extremely rare color variety, which is completely transparent and is only known from a few occurrences worldwide. It is believed that the pink color is due to small amounts of aluminum and phosphorus that substitute silicon, and exposure of the quartz to natural gamma radiation. Sands with a dominating proportion of pink quartz excavated from the soil and extracted from a breccia layer in the crater strewn field of the Chiemgau meteorite impact suggest that normally colorless quartz sand was irradiated during the impact event and may possibly be found at other impact sites. Abstract. – We use and variegate the title of this article published in Earth-Science Reviews to show how science may (mal)function, how scientific results are manipulated, and how a few exposed impact researchers (the authors of the Earth-Science Reviews article included) are counteracting exactly the ideas presented in that article. 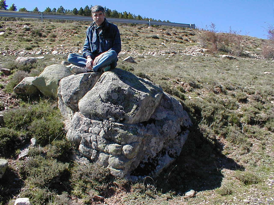 “The convincing identification of terrestrial meteorite impact structures: What works, what doesn’t, and why” is the title of a comprehensive and in principle not too bad article written by Bevan M. French and Christian Koeberl and published in Earth-Science Reviews (French & Koeberl 2010). We however would like to take up this title to once more point to the large Azuara and Rubielos de la Cérida impact structures in Spain and the related controversy shedding light on how science is manipulated, in this case with regard to some impact researchers from the so-called “impact community” (whatever that may be). Fig. 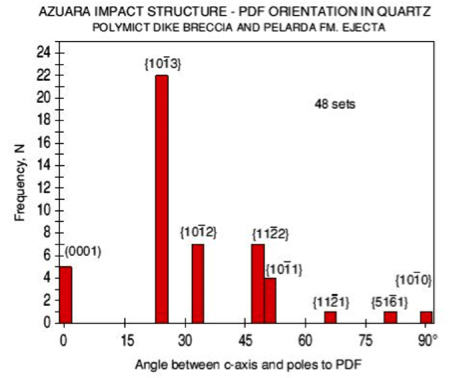 1 A-D: PDFs in quartz from the Azuara impact structure. 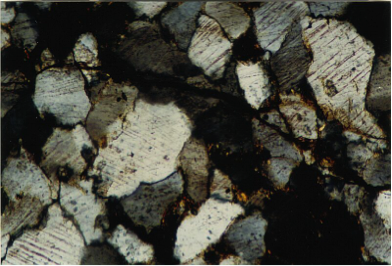 A, B: in quartzite rocks from the impact ejecta deposit (Pelarda Fm.). 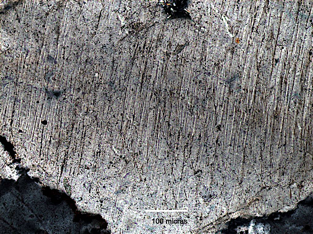 C: from a polymictic strongly shocked breccia. D: Frequency diagram of Azuara PDFs based on data elaborated by Dr. A. Therriault. All figures have been published earlier. So Lynn B. Lundberg begins the first chapter of his book IMPACT GEOLOGY: THE BASICS that was published in December 2016. This date reminds of the year 1989 when H.J. 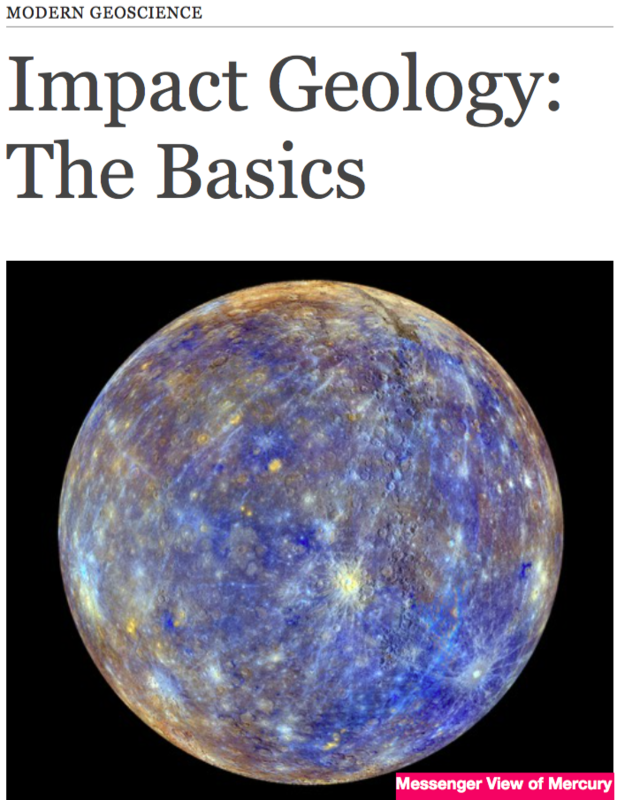 Melosh published his book “Impact Cratering – a Geologic Process”. This is nearly 30 years ago, and since then it has possibly become the most referred quotation in the impact research literature, although meteorite impacts, impact cratering and impact geology have remained a closed book to most geologists worldwide, unmissable until today. Hence, we hope that this new book can establish itself as a worthy successor of the Melosh book and get widely disseminated. As an iBook it is available at the iBook store free of charge, and with the permission of the author you may download his book HERE as a pdf version. A new book has recently been published: Hannu Ahokas: Previously unidentified meteorite impacts in South Finland. In Finnish with English abstract – Click HERE for more information. Wait a few seconds, and the show will pass off. Mouse over the slide, and it will stop. Leave it, and it will continue. Advance the slides with the left/right angle brackets.